If you live in Brooklyn and see smoke when you look out your window, don’t be alarmed. It is coming from Brooklyn College, location of last night’s Lineup Of A Lifetime Concert. The show was so hot the Walt Whitman auditiorium was absolutely, positively on fire. Mordechai Ben David. Avraham Fried. Lipa. Shloime Gertner. Yeedle. Yossi Green. All joining together to honor Moshe Laufer and his thirty years of contributions to Jewish music. Yossi Tyberg and Gershy Moskowitz, together with concert coordinator Menachem Toker put together what was, quite possibly, the best concert I have ever been to. The minute you walked into the auditorium you knew you were in for something truly outstanding. There were instruments all over the stage, and you almost wondered if there was going to be enough room for the singers. If my count is correct, there was a fifteen piece orchestra in addition to the Shira choir, led by Shraga Gold, which meant you had roughly twenty people on stage, with equipment, and that doesn’t even include the singers. TeeM Productions Orchestra consisted of Shai Bachar (piano), Eli Laufer (synthesizer), Sima Ephron (bass), Dave Solomon and Ari Boiangiu (guitar), Gal Gershovsky (drums), Samuel Torres (percussion), Danny Flam, Don Downs, Matt Peterson (horns), Mark Gatz (sax), Jonatan Keren and company (strings). A gorgeous, full color, forty page glossy concert program put together by graphics king Sruly Meyer contained stunning color portraits of all the artists, over two dozen behind the scenes photographs, detailed biographies of the singers and, of course, lots of colorful advertisements. One disclaimer before I run through the actual show. I am sure I am going to get the names of some of the songs wrong. This three hour concert had quite a few medleys, which meant there were a lot of songs, many of them oldies, making it extremely time consuming to track down the exact name and album of every song. Feel free to point out my mistakes in the comments and I will be happy to correct them. The auditorium was about two thirds full when concert MC Nachum Segal came on stage at 8:05, twenty minutes later than the planned starting time. 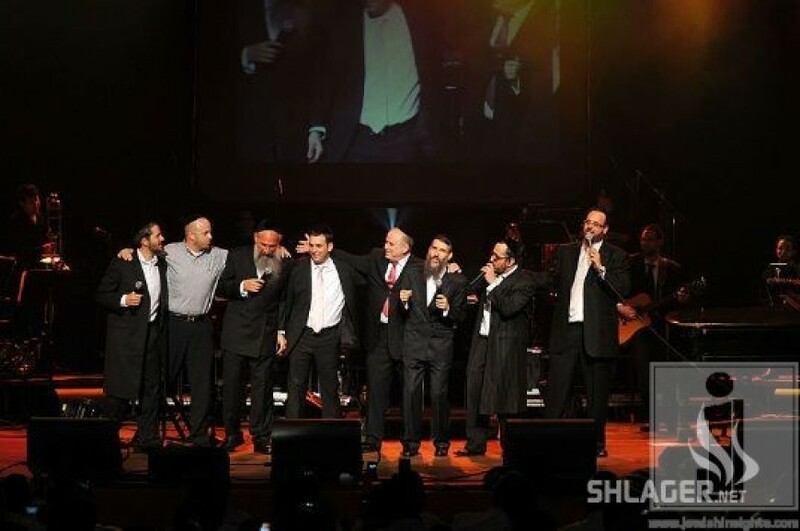 Segal introduced the concert, a unity celebration honoring thirty years worth of Moshe Laufer’s music and then Laufer, conductor for the evening, came out on stage as the band launched into a medley of Moshe Laufer songs. There were so many of them that I couldn’t possibly identify them all as they kept changing so rapidly. I did pick out Invei Hagefen, Shehechiyanu, Samchem, Habeit, Racheim, Chazak and Shiru Lamelech. The orchestra was top notch and the sound, by Eli Lishinsky was loud enough that I could feel the vibrations in my seat, but not disturbingly so. After all, it is a concert. You want to feel the music, don’t you? Interestingly enough, the talented Shira choir was placed on the women’s side of the stage, so a few of them had their backs to the audience to avoid looking at the women. I don’t know why they couldn’t just nudge the instruments all over a few feet so that they could place the choir on the men’s side of the stage and not have their backs facing the audience. After a nice opener, things kicked into high gear right away, with almost all the performers coming out singing one of Laufer’s compositions.. Shloime Gertner came out from the left, singing Laufer’s Shechiyanu, followed by Lipa coming in from the right singing Ogil V’esmach. Lipa and Gertner singing together was quite a treat and they were clearly enjoying themselves. Mordechai Ben David and Yeedle emerged together, hands clasped together and held high over their heads, singing Migdol. Last onstage was Avraham Fried who could be heard slowly singing the low part of Kol Yisroel, but was nowhere to be seen. You see MBD onstage, putting one hand across his brow as if he is searching for Avremel, and the spotlight finally shines on Fried, who was on the far left side of the auditorium, in the audience, calling out “I’m over here!” Fried joined his fellow perfomers on stage, high fiving each one as he passes them and they all energetically continue the song accompanied by lots of jumping and dancing. Kudos to Mordechai Ben David and Avraham Fried, the only two singers who had their jackets buttoned. I know, it does get hot up there, but come on! If you are on stage, your jacket/bekesha needs to be buttoned!! As the five performers filed off stage, Nachum Segal came out and introduced Moshe Laufer’s son, Eli, a singer, songwriter and arranger in his own right. He sang a song that I did not recognize at all and I have no idea whose album it is on, or which of the two Laufers composed it. Laufer Jr. was enjoyable and aside from working the synthesizer, he also had a mike and was doing backup vocals on and off during the evening. The best part of the song for me was seeing Moshe Laufer singing along with his son (although he had no microphone) and clearly shepping nachas from his very talented son. The next singer was introduced by Segal as “another link in the musical chain” and I was wondering if there was perhaps another Laufer who was going to be performing, but it was Yeedle who came on stage, wearing a white, rhinestone studded tie. (Yes, you read that right.) It wasn’t over the top or anything, but I have never seen a frum guy in rhinestones before. Back to the music: Yeedle sang Ella, followed by a beautiful hartzig song by R’ Akiva Homick of Yerushalayim – again, another song I couldn’t place, but he sang it well. Yeedle took a minute to mention how he has enjoyed working with Moshe Laufer over the years and thanked Eli Laufer for composed many of his songs. His final song was Emor Me’at, arranged by Eli Laufer, with Yeedle doing some fancy footwork on the words. I was surprised that he didn’t sing any songs from Lev Echad, but his set was quite enjoyable. At this point in time it was 8:25 and taking a quick look around, the place looked quite full. If it wasn’t a sellout crowd, it was very close to it. While Yeedle left the stage amid chants of “We want more!” Nachum Segal was back quipping “Don’t know what to Say Asay about the next performer,” and it was obvious that London’s favorite son, Shloime Gertner was up next. Gertner’s next two songs, Nissim and Hashomayim, were exact duplicates of his performance at the Miami Pesach concert, except that on Pesach he didn’t get to dance with Moshe Laufer. Gertner exudes sweetness, chayn and simcha when he sings and his voice is really something special. Clearly the audience agreed as they cheered and applauded for Gertner. After Hashomayim, a group in the audience started singing Nishmas but Gertner sang Barchi Nafshi, an older Moshe Laufer song and putting his mike in front of Laufer he even got Laufer to sing a few bars of this beautiful song. Gernter certainly did it justice and as always, I am impressed with just how mellifluous his voice is. Finally, Gertner sang Say Asay, the song everyone had been waiting for and the crowd really got into it, especially the people sitting around me who were all dancing in their seats. The spinning lights on the walls of the auditorium were a nice touch, though a bit annoying when they got in your eyes. At times the music got a little noisy and was a little overpowering, but there was so much energy in the room that no one really seemed to care. Next was a special tribute to producer and composer Moshe Goldman who did fifteen albums with Laufer and passed away just a few months ago. Eli Laufer came back out and sang a beautiful song with lyrics from Neilah that I have never heard before and the younger Laufer was even more enjoyable on this song than he was with his first. Nachum Segal introduced the next performer, the ever ebullient Lipa Schmelczer whose new album, according to Segal, is one of the best selling Jewish music albums ever. Lipa bounded on stage wearing a chartreuse bekesha embroidered with flowers singing Hora Yes, Lashon Hora No. He was dancing and spinning all over the stage and while I don’t speak Yiddish, it was easy to get the gist of this strangely addictive song. At one point Lipa broke into a rap and there were some very funky sounds coming out of the band, but as always, Lipa is just plain fun. This was actually the first time I have ever seen Lipa live and I found him to be ten times better in person that he is on an album. Lipa took a few minutes to chat with the audience, confessing that while all the other performers spoke about all the times they have worked with Moshe laufer, Meimka D’Lipa was actually the first of his albums to feature the talents of Moshe Laufer, although Lipa actually sang with Laufer at the age of seven, on his brother Zisha’s CD. Lipa invited everyone to join him in at his Airmont, New York, Shul for a very special Kabalas Shabbos, saying his Shabbos guest, Shloime Gertner would be davening for the amud. Kabalas Shabbos? It is not Kabalas Shabbos I want to hear, it is zemiros. Mrs. Schmelczer, do you mind if we walk over on Shabbos and join you for a meal? Let me know what I can bring! Continuing the Shabbos theme, Lipa introduced Ve’anpaha Ne’hirin, a beautiful slow song from his album, with the words that immediately precede Barchu from Friday night Maariv, explaining how people tend to rush through these beautiful words, in a hurry to say Barchu and start Maariv. The strings in the introduction were breathtaking and Lipa started this song from Nachum Segal’s podium, as if he were the chazzan standing by the amud. It was beautiful and hartzig. Lipa, who is an entertainer as much as a singer kept the audience spellbound, saying that he had been asked backstage why Hentelach isn’t on his new album. “You don’t ask the Rambam why cheilek vov doesn’t have cheilek hay in it, do you?” responded Lipa, explaining that he has so many songs, so much good material to work with and there are only so many songs that he can put on each album. Another anecdote Lipa told had someone complaining that the songs on Meimke D’Lipa weren’t particularly singable, to which Lipa replied, “But that is good. I need to make a living! 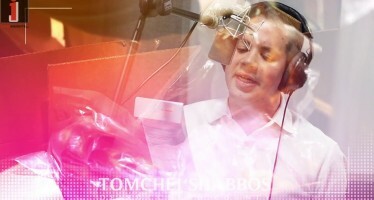 I will sing the songs and you can hum along!” Lipa has such personality and truly embodies the phrase simchas hachaim. It is wonderful to see how Lipa bounced back from the fiasco that was the first Big Event and came back bigger and better than ever. Lipa’s next song was Mizmor L’Soda a wild song that had the crowd roaring and it was very entertaining to hear the Shira choir singing backup on a rock song. During the chorus, Lipa jogged rapidly in place, picking his knees way up high and it was a riot to see his payos bobbing up and down. At one point, Lipa was playing air guitar, accompanying Ari Boiangiu. After welcoming concert coordinator Menachem Toker in flawless Hebrew (how is it that all these singers speak Hebrew so well, but so few of our yeshiva bochurim do?) Lipa welcomed Zevi Tyberg, son of producer Yossi Tyberg. Lipa spoke about how sometimes life can be difficult and filled with obstacles, dedicating his next song to Yossi Tyberg’s young son who was in a car accident several weeks ago. Lipa spoke about Yossi Tyberg’s emunah and positive outlook through a difficult situation and sang Shwekey’s Ki Hashem, adding in some English lyrics about having bitachon. Lipa invited the audience to sing along and this was the first time during the night that I found myself in tears. I respectfully ask everyone reading this review to stop reading right now and take a moment to say a kapittel of Tehillim for Boruch Mordechai ben Tessel, who is in need of a refuah sheleima. While Lipa finished with the song, the audience kept on singing this heartfelt song that was clearly a tefilla in its own right. Lipa joined in, giving the song an absolutely stunning ending. Ok, people, I wasn’t joking. Stop reading and say one perek of Tehillim. Now. Every tefilla counts. Lipa’s final song, Hentelach, was one of the two moments during the night when the place just exploded. Lipa asked everyone to stand up, and the audience was on their feet, screaming, singing along, waving their hands and dancing. There were even a few screaming girls dancing on the side. What can you say about Hentelach? From a musical perspective it makes no sense, but the song is just insane and it really speaks to people. There is no question that Lipa connected with his audience in a very big way and is plain and simple, hotter than ever. Nachum Segal came back onstage, reminding the audience that the evening was a fundraiser for Vaad Haolami, an Israeli tzedaka that raises money for sick children, even giving a shout out to a girl in the audience who was recovering from a transplant, funded by the Vaad. After a video about Vaad Olami, Hilly Gross took the podium, calling the evening a “summit meeting of the greatest Jewish music of our day, all on one stage”. He spoke about Lior Yisroel, a 12 ½ year old Israeli boy, whose story was featured in the concert booklet. Lior has a massive brain stem tumor and requires surgery in the United States, at a cost of $300,000. Not only were there volunteers in the audience collecting money, but Gross divulged that all the singers for the concert had donated their payment for appearing in the concert to this very important cause. After a very brief intermission, it was time for Avraham Fried, who just celebrated his 30th anniversary in the music business. Again, Fried began singing from somewhere offstage, finally emerging to sing Ki Hamitzva. If you have ever seen Fried in person, he is not a physically big guy by any stretch of the imagination, yet it is amazing to see how someone so slight can dominate a stage that has twenty other people on it. Fried’s voice was full, rich and absolutely gorgeous last night proving once again how it is that after all these years he is still at the top of his game. The crowd clearly enjoyed Avremel, repeatedly calling out requests for Tanya. Fried did a mini trivia game, having the band play a snippet of an intro and having the audience guess the song. First was R’tzey, then Tanya, then turning to Moshe Laufer he asked him to take a bow, while at the same time, asking the audience to give Laufer a standing ovation. Fried explained how a singer brings a song to an arranger that may consist of just a part A and a part B, but it is the arranger who adds in the introduction and other parts, bringing thesong to life. 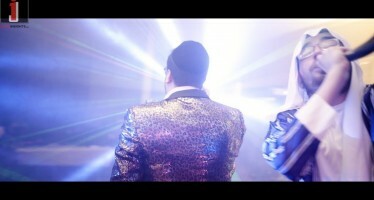 Fried launched into Modeh Ani, a prime example of a good song, taken to a whole new level by a top notch arrangement. 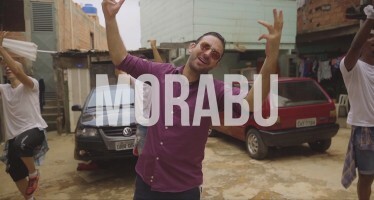 Fried introduced his next song as one of “the top ten songs I wish I would have recorded”, Laufer’s Elokai Neshama,which was sung originally by Dudu Fisher. The video screen in the background, showed video of Lior Yisroel, and when they superimposed the video of Avremel singing the words “v’ata asid l’itla mimeni” over the Vaad Olami video of Lior Yisroel it was an incredibly emotional moment. Next, Fried spoke about achdus among klal yisroel in general, the singers who graced the stage and even the audience who came together as one to support Eretz Yisroel during these turbulent times, and specifically Vaad Olami. Finally he introduced a medley of songs that Laufer did for him, saying “I had the good fortune to bring these songs to the world”. The first song was Invei Hagefen, a song that Moshe Laufer composed in honor of his own engagement, followed by Keitzad Merakdim, which Laufer composed for his own wedding. Laufer joined Avremel and they danced together. It must have been getting hot up there, because Fried took off his jacket and put it down on the piano before launching into K’sheim Sheani, followed by V’hayu L’mishisa, as he danced all over the stage. He followed up with L’vinyanim, another song I didn’t recognize and finally Chazak. Seeing Fried playing “air violin” with the string section as he sang Chazak was definitely a memorable moment and at the end of the song, he changed the words from “ad bi’as goel, chazak” to “Moshe, Moshe, chazak!” a very nice tribute to the special guest of honor. The next song started off with Shai Bachar playing an introduction on the piano, and Avraham Fried at the piano singing the opening words of “If I Were A Rich Man” from Fiddler on the Roof. The audience was a little surprised, to say the least and Fried smiled as he quipped, “Not Moshe’s song, but very similar,” and then switched to Koach. As Avremel left the stage, Moshe Laufer took the microphone, thanking Avraham Fried for making his songs come alive and giving Fried a bracha that he should always have koach to sing. Laufer also took a moment to thank concert coordinator Menachem Toker. What can you say about Avraham Fried? Plain and simple, thirty years later, he is still solid gold. A great night just kept on getting better. After a short video featuring Lipa, MBD, Fried and Yossi Green all shopping together at Pomegranate, one of the evening’s sponsors, it was time for MBD to take the stage. The band began with a slow klezmer sounding introduction with Mordechai Ben David singing offstage, then bursting onstage singing Keytzad Merakdim, before moving on to V’karev P’zuraynu and Samcheim. Though the hour was late (10:35 and already two hours and twenty minutes into the show) MBD spoke about how we are facing difficult times, both in world affairs and in tragedies that people are facing on a personal level. He spoke about how Boruch Chait was once sitting with a sick child who asked him to write a song on the spot, and Chait made up his timeless “Pischu Li”. MBD spoke about the enormous power that a tzibur can have and once again asked people to daven for those who were in need of refuos and yeshuos. Seeing video of Lior Yisroel, again with live video of MBD superimposed on the screen, knowing the difficulties that particular people affiliated with the concert were facing, I found myself tearing up for the second time as Mordechai Ben David sang the words “lo amus ki echye” and “pischu li shaarei tzedek”. It was a truly heartfelt moment, and once again, I will ask you to stop reading and say a perek of Tehillim for Lior ben Shani. Perhaps the most beautiful part of this touching song is how hopeful and optimistic it is and Laufer was dancing in place by the end of the song. While there were already two generations of Laufers on stage (both Moshe and his son Eli), MBD called yet another Laufer onstage, 12 year old Benny, whose Bar Mitzvah is in two short months. Shai Bachar vacated the piano bench and the absolutely adorable and poised Benny Laufer took his place at the piano, accompanying Mordechai Ben David as he sang Mimkomcha. I will tell you that with such a full orchestra, it was hard to hear the piano, even after Shai Bachar adjusted the microphone, but it was clear that the young Laufer is very gifted, as he played the song without the benefit of sheet music. All four photographers who had been all over the stage and auditiorium all night converged at the same spot to take pictures of Benny Laufer who seemed very at ease as he looked around smiling, not the least bit intimidated by accompanying the king of Jewish music. But for me the best moment of the night was when Moshe Laufer, still conducting with his baton in hand, turned to face his youngest son with the proudest smile you have ever seen plastered all over his face. If that isn’t yiddishe nachas, I don’t know what is. MBD went on to sing a medley of hits, singing Tov L’hodos, Od Yishama (dancing with Moshe Laufer as he sang), Yibane, Hold On, Ze Shir Shevach and Yerushalayim Is Not For Sale. The applause was absolutely thunderous and there is no question that the crowd enjoyed every minute of MBD’s performance. And then the orchestra started playing Omar Rabbi Akiva and from the moment MBD opened his mouth to sing the first note, the place exploded, marking the second time during the night that the crowd went absolutely and completely crazy. Everyone was on their feet, dancing, clapping, singing along, whistling, cheering. The place was absolutely sizzling and instead of watching Mordechai Ben David, I turned around and watched the crowd who was completely caught up in the music. It should be easy to identify anyone who was at the concert last night, because they will all be hoarse today after all the singing that went on during this song. Imagine, a rock song, sung by a Zaidy who was been singing for almost forty years and is still as hot as ever. Just goes to show you that if you are talented and keep in touch with what the people want to hear, you can still wipe the floors with everyone else out there. It was already very, very late by the time Shai Bachar left the piano and finally time for Yossi Green to come out onstage. The audience was ready for Green and were singing Anovim before Green ever came out. Had Green waited for the audience to quiet down, we would probably all still be at Brooklyn College. Green just started playing and waited for the singing to die down, but it didn’t, probably because the song he started was Anovim. All the performers came onstage to join Green at the piano and with Lipa starting the song. Each performer did a beautiful job on this stunning song, with Green finally taking the end. The song ended with Mordechai Ben David, who was standing directly behind Yossi Green, giving Green a hug, putting his hand on his head and bentshing him that he should continue to write beautiful songs. It already after 11 o’clock at this point and my understanding is that Mordechai Ben David had to leave after his set, but since the crowd had decided that Anavim was the song they wanted to hear, Green started with that song, which wouldn’t have been the same without MBD. Sadly, that was the only song that Green played other than the finale and I was disappointed not to hear more from the very talented Green. The finale was Shiru Lamelech, a song that is so good, it is possibly the best song Yeedle will ever record. It was clear that they hadn’t really rehearsed this song and it started with MBD signaling people, telling them who should sing when. They were all dancing a little two step and it was cute to see them all try to stay in sync with each other, especially seeing the very tall Yeedle try to get his arm around the much shorter Lipa’s shoulders. At one point, Mordechai Ben David waved at someone in the audience, then left the group and went over to the audience, giving a knippel to a disabled boy. One by one, all the key players ended up on stage, with all three Laufers joining the line, as well as Menachem Toker, Gershy Moskowitz and Yossi Tyberg. Avraham Fried asked Yossi Green leave the piano and join the group and then stopped the music completely, asking the entire audience to stand up. He asked everyone to say a tefila for Yossi Tyberg’s son (if you missed the Tehillim name before, it is Boruch Mordechai ben Tessel) and expressed fervent wishes for b’suros tovos. Tyberg, a model of emunah and optimism, waved his fist in the air and I can only join Avremel in personally wishing the Tyberg family a refuah sheleima and simchos b’karov. The concert came to a close at 11:15, amid singing, clapping and the good news that Vaad Olami received some sizable donations during the evening. There was video taken during this concert and if and when this video becomes available for commercial release, I strongly suggest you buy it. It was truly the lineup of a lifetime. If I had to sum up this concert I could do it in only two words.